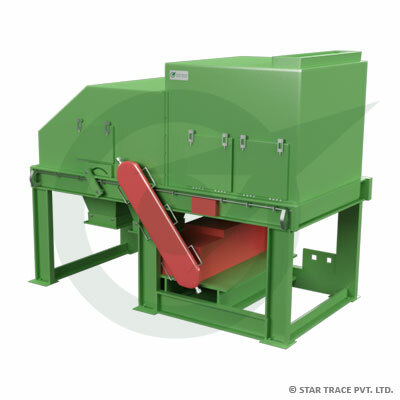 Eddy Current Separators | ewaste Recycling | Star Trace Pvt. Ltd.
Star Trace is a highly known and established manufacturer and supplier of eddy current separators, which are ready to be installed in your separation facility. This separator uses a highly powerful eddy current separators, conveyor belt, two variables discharge area and support frame. The optional vibratory feeder provides a consistent flow of material to the Eddy Current Separators. These top-class non-ferrous eddy current separators are highly reliable, durable, high performing and available at reasonable prices. Our eddy current separators is manufactured using the best quality raw materials to ensure satisfaction of customers. These eddy current separator devices are perfect and effective work for removing non - ferrous metals from other products. Applications of eddy current separators are aluminum cans from municipal waste, aluminum flakes from shredded PET, brass and aluminum from foundry sands, and metals from shredded automobile/e-waste scrap. Other metals, such as lead can also be removed. For successful non-ferrous separation, a magnet should be installed prior to an eddy current separators. Star Trace eddy current rtotor utilizes an alternate magnetic field for producing electrical currents in conductive metal. The electrical current produces its own magnetic field around an object, which opposes the magnetic field from the Eddy Current. This repulsion diverts the object from the product stream. Mass, conductivity and density influence the force and distance an object will repel. Eddy current separation system manufactured and supplied by Star Trace encompasses all the equipments above necessary to separate non - ferrous metals and add ferrous metal separation equipment. It is significant for removing ferrous metal prior to exposure to the eddy current separators. Strong magnetic field magnetizes and holds ferrous metal. The Ferrous Metal will heat up and could burn holes in belt and cause significant damage to the eddy current rotor.